During the worst month of the year on our wallets, I am so excited to tell you guys about an amazing new app as well as offer an amazing GIVEAWAY to one of you! The app is called LyfeLine Milestones and helps you track your baby's developmental progress along the first 2 years of their life. Through this app, you can track your baby's development with the same exact assessment used by pediatricians and the American Academy of Pediatrics, and learn how to promote your child's growth with activities designed by developmental experts. In this day and age, I think most parents gauge their child's development based on what their friends' babies are doing, by what their parents, in-laws, or other relatives tell them their child should or shouldn't be doing, and through their own research on the internet - oftentimes from uncredited sources. Because of this, many mothers are uninformed, end up comparing their child to others, and simply don't accurately understand and measure their child's development, and they think maybe they are not doing it right (enter our dear friend once again, 'mommy guilt'). I know that as a first time mom with my son, I certainly felt this way when I saw Facebook videos of my friends' two year olds singing and reciting animal noises when my son was not speaking more than two words at all. At that point, we discovered that Landon did in fact have a speech delay and we worked intensely with him for the next 2.5 years with speech pathologists. 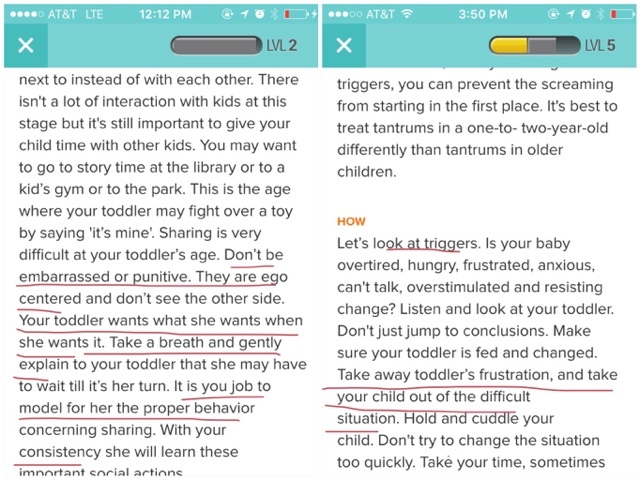 That is only one of the reasons why I believe in this app so much - because it gives oftentimes completely clueless parents a tool to help them truly understand their child's nature and development based on accredited pediatricians and gives parents thoughtful activities designed by experts to work with them on areas of need. Had this app been around 3 years ago I know I would have benefited a lot from it, and I think it could have helped me see Landon was behind in his speech earlier on, it could have given me tips and ways to work with him on his speech in helpful hands-on ways, and ultimately could have saved a lot of time and money down the road with speech therapy that we only started at age 2. I still love this app even for my daughter who is actually 'advanced' for her age, because it gives me insightful tips to help with her challenging behavior and tantrums, and also gives age appropriate activities to do with during these winter months indoors. For example, Blair is a very defiant, oftentimes unruly little girl when she doesn't get her way, over some of the most irrational things. When I answered questions about her behavior in this manner, LyfeLine gave me some great feedback, tips, and ideas on how to manage this behavior and show me ways to help her grow out of it. It also gives us lots of activities to work on together. 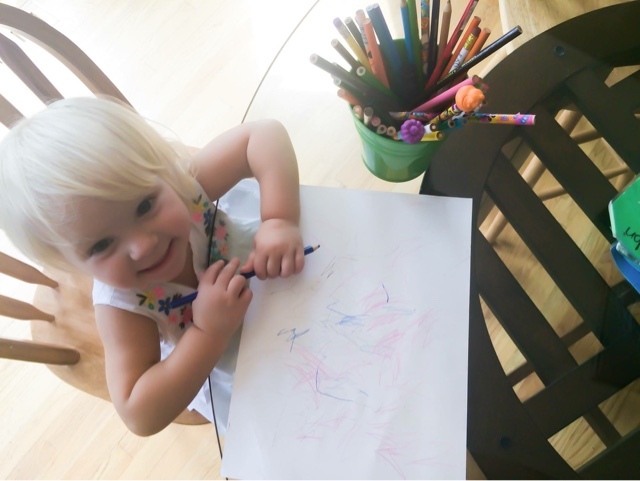 For example, Blair loves table top activities like coloring and stickers and all things artistic, so I thought it would be fun to work with her on an area she already shows a lot of interest in. LyfeLine suggested she work on drawing in a circular motion instead of scribbling lines to work on developing her fine motor skills even more. That is just one example of the many activities from a range of categories, including fine motor, gross motor, language, physical, social, and self help. It's really like a personalized Pinterest for your baby with educational and developmental activities for them - none of which require you to go out and spend any money - they only require you and your child and your time, and sometimes household items that you would already have in your home. We absolutely love this app for so many reasons and are so thrilled to offer one of you your own full year premium subscription -- an $85 value!! a Rafflecopter giveaway **Giveaway will run for 1 week from today and will officially close at 12:00am cst on 12/20/15. **Disclosure: I have received a one year premium membership to LyfeLine Milestones to facilitate my review but the review and all opinions contained herein are 100% my own. My daughter loves to dance!